The Cherry Blossom Princess Program is a week-long program that offers cultural, educational, and professional development opportunities for young women leaders, ages 19 through 24, from across the United States and around the world. The NCSS Cherry Blossom Princess Program is a week-long program that offers cultural, educational, and professional development opportunities for young women leaders, ages 19 through 24, from across the United States and around the world. The program takes place each year during the National Cherry Blossom Festival© in Washington, DC and is proudly managed by the National Conference of State Societies. 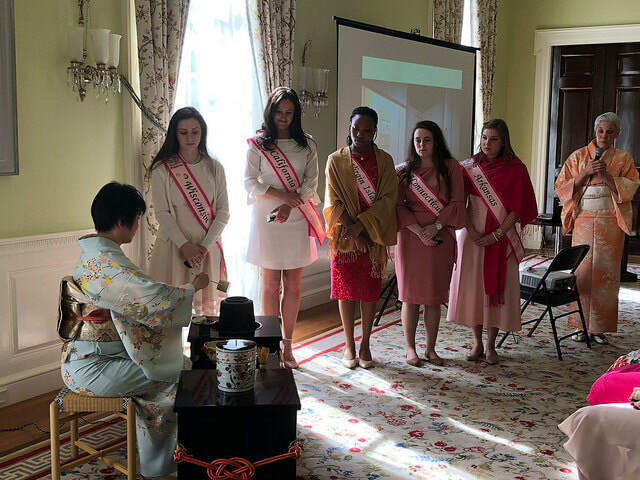 Young women leaders are selected by a State/Territorial Society or international embassy to be Cherry Blossom Princesses based on their leadership and academic achievements along with their interest in social, civic, community, and world affairs. 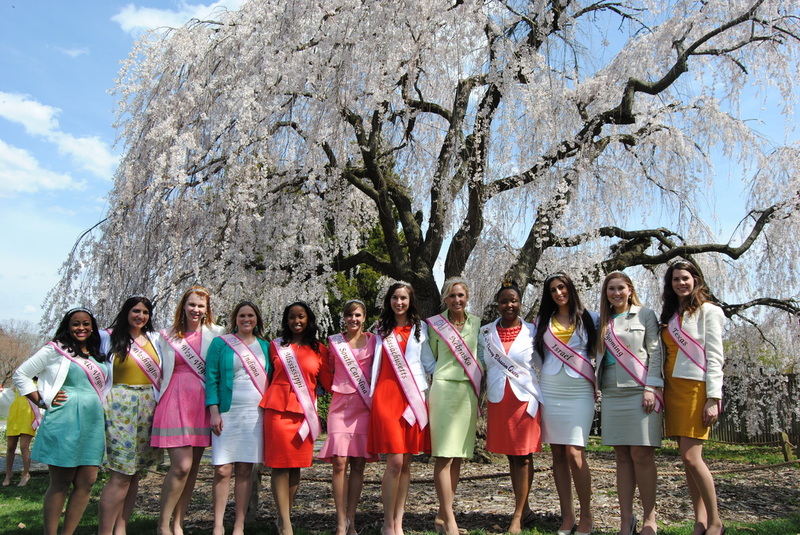 As Cherry Blossom Princesses, these young women represent their respective states, territories, and countries in both public and private events held each day across the Washington, DC area and engage with top government, business, arts, and media leaders. 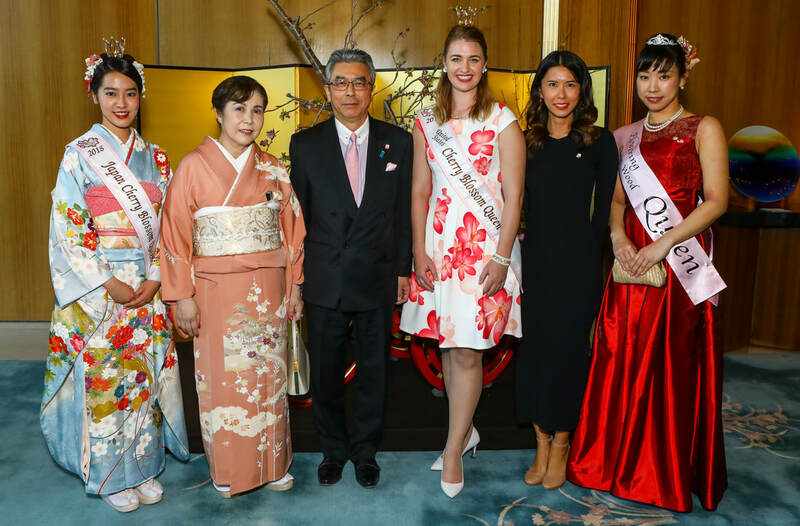 Alumnae of the Cherry Blossom Princess Program include leaders in many fields including government, business, science, education, and the arts worldwide. Two current U.S. Senators, the Honorable Shelley Moore Capito of West Virginia and the Honorable Lisa Murkowski of Alaska, are both alumnae of the Program. 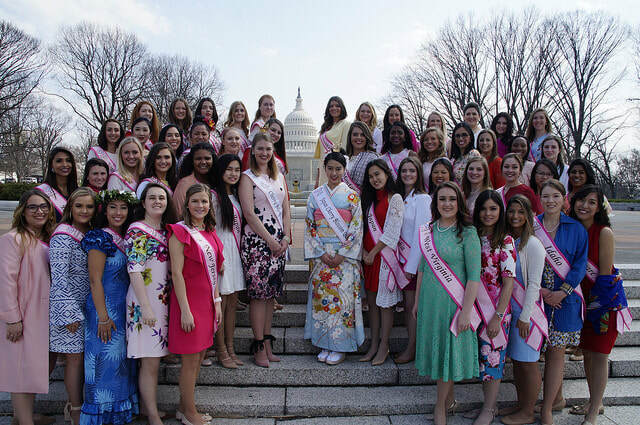 As Cherry Blossom Princesses, these young women represent their respective states, territories and countries at public and private events with government, business, arts and media leaders held during the week in Washington. In the past decade alone, the Cherry Blossom Princesses have met with former First Lady Laura Bush; toured the White House, attended events at the Japanese Ambassador’s Residence; visited Arlington Cemetery, The Institute for Peace, Kennedy Center and the National Moments; perform community service for the homeless, promoted literacy at local elementary schools; and learn about the Japanese culture and the friendship between our two countries. 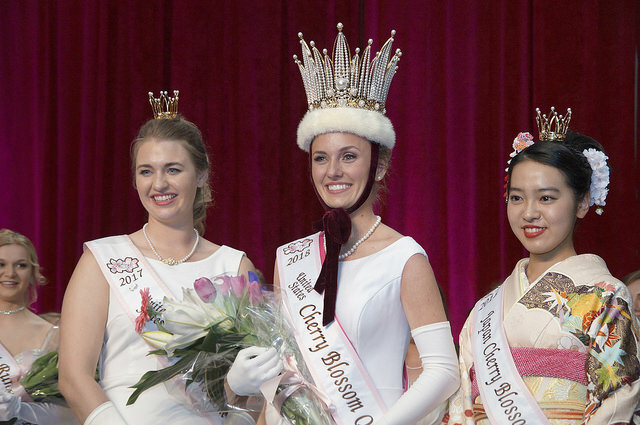 Each year a US Cherry Blossom Queen is selected among the class. Each Princess has been selected by their State Society based on their achievements and all the US Princesses are qualified to represent the United States. Therefore, it is the tradition of the program that the US Queen is selected by the spinning of a wheel. The wheel is spun once for the Runner Up and a second time for the Queen. The Queen then gets the opportunity to visit Japan on a good will tour to celebrate the Friendship between the United States and Japan. She visits Tokyo and is hosted by the Japan Sakura Foundation and visit with many of the local dignitaries and the Prime Minister. She also is hosted by the Gakudo Kofu Founation in Ise City, where she visits Pearl Island. This year the US Queen visited Shikuoka, where the research laboratory that created the Cherry Blossom Trees the surround the Tidal Basin were developed. It is an amazing experience! Have questions about the program, email the Program Chair.